The 5p, 10p and 20p coins that were minted at Tower Mint are now also in circulation. Tower Mint used the Pobjoy Mint portrait of Her Majesty the Queen on the coins. Interestingly the denomination on the 20p coin is included both in words as well as the figure '20'. This is so far the only denomination to have that. Furthermore there appears to be some kind of 'batchmark' in the same place where Pobjoy Mint used that. Only the 2 pounds coin which was also minted at Tower Mint has not yet been released. Thanks eurocoin. Annoyingly, Tower Mint’s website doesn’t appear to be selling them yet. Only one eBay seller that I can see so far. The coin looks to be in terrible condition!! Cheap though I suppose.
. Furthermore there appears to be some kind of 'batchmark' in the same place where Pobjoy Mint used that. Only the 2 pounds coin which was also minted at Tower Mint has not yet been released. Quality looks better than the usual Tower mint products. Thanks, but I was referring to the Tower Mint’s 5p, 10p and 20p. The Pobjoy’s 1p, 2p, 50p and £1 are more readily available. Is the “20” a remnant of an earlier design? It must be some kind of mistake. 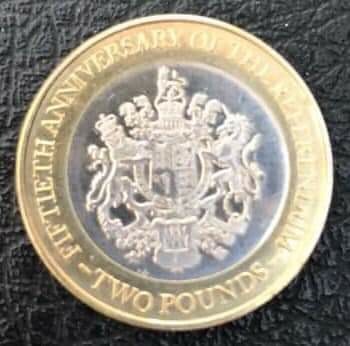 My first thought was that the raised rim of the coin was too narrow to carry the inscription at the same size as it is on the other coins (with the “20” filling the extra space), but as “Twenty Pence” is smaller than the rest of the wording, this clearly isn’t the case. 5p, 10p and 20p were also made at Pobjoy Mint. I have today received confirmation that the 2 pounds coin in this series will still be issued. It will be minted at the Pobjoy Mint. The entire referendum series was minted there. Although I in August of last year was informed there were not going to be sets, a very limited amount of 1,000 sets is now available here. Thanks eurocoin. I got most of the coins individually last year, so not too fussed about the set, but I notice they’re selling the £2. Just ordered the set. Hope they are bunc. Why don't Pobjoy sell them on their site? Thanks for the info btw!! I don’t think they’re bunc. The artwork just says “Gibraltar Decimal Currency Set”. Probably just the standard circulation coins shoved into a folder but the term “Brilliant Uncirculated” isn’t used as much as it once was - probably because Facebook-generation might not know what “Brilliant” means (or even “Uncirculated”). Quite why they need the “Decimal” in there is another matter. We’ve been Decimal for 48 years! Just received my set. You were right Alan, it's uncirculated quality. The coins have a few marks, the penny and pound coin especially. I've seen worse though! I tried to attach some photos but couldn't make them small enough! Pictures can be scaled down on a site like this one, without loss of detail on a computer screen, but without the possibility to enlarge. If the possibility to enlarge is vital, you can embed and scale the picture with BBCode. Videos can be embedded here if they are posted on YouTube. If you rename, move or change embedded stuff, it will be lost on this site, unless you update the link.